I couldn't help myself from jumping on the CAL (crochetalong) bandwagon again. This time I'm making a bag (or purse as they call it here in Texas) designed by the wonderful crochet designer Tatsiana Kupryianchyk aka Lilla Bjorn Crochet from the Czech Republic. I'm on part five and having such fun learning another new technique - overlay crochet. "I had always wanted to create something in the medium of crochet that looked like a mandala or stained-glass rose window. When I eventually found my way into this technique, I knew I was there." "densely textured cable crochet with color changes on every row or round...long stitches cover up horizontal rows or concentric rounds behind them...unwanted ones disappear like magic"
Tatsiana's CAL pattern is well written with very clear photos and video support. And I'm extremely impressed that this CAL has been translated into Dutch, German, Spanish, Swedish, Finnish, Danish, French and Hebrew. Following the hashtag #peacocktailbagcal I can see versions of this bag being made all over world. So cool! I find myself leaving comments "beautiful", "wonderful colors"... and wondering if the recipient can read English but Instagram helpfully has a translate function. 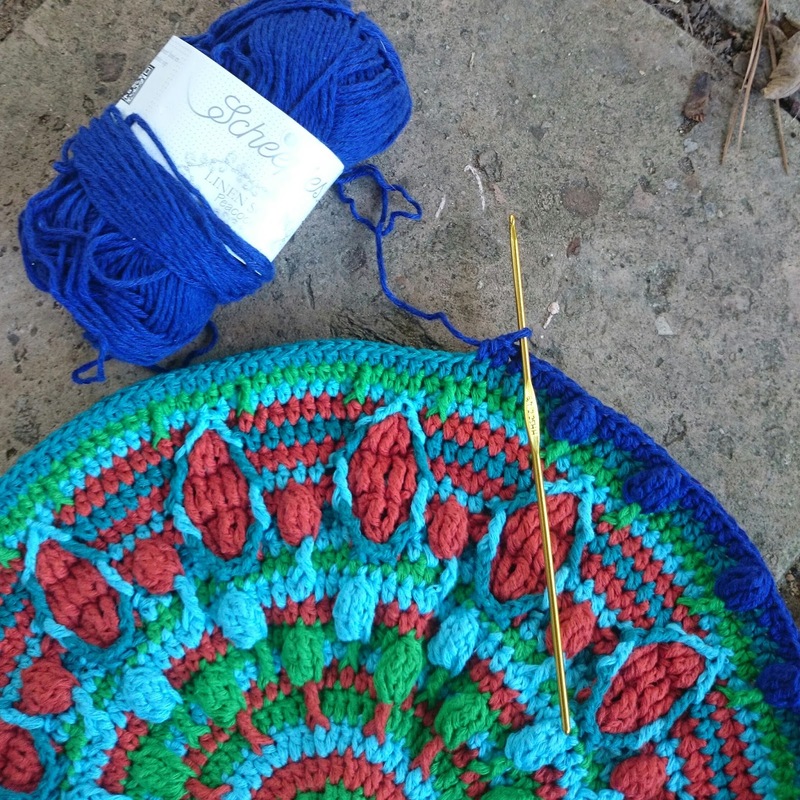 In my mind I can visualize overlay crochet as the perfect technique for a Christmas tree ornament. And Tatsiana has three gorgeous ornament patterns for sale. My favorite is her Starry Dream design. Now if I can resist another CAL I might just make some as gifts. Have a great week y'all and please do let me know if you've tried overlay crochet before or if you're feeling tempted! I love the buzz of learning new techniques. I'm impressed to see a pattern with so many translations - that's wonderful. I would like to support that CAL just for that fact because it takes enough work to write a pattern in one's own language and just as much work to translate. Even though I don't have the time and energy to give to a CAL - always too many other things on the go - I would love to vicariously participate by watching your progress as you share it. It's such a visually appealing pattern!